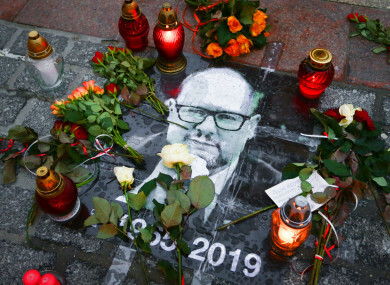 POLES WILL GATHER today in the Baltic port city of Gdansk for the funeral of murdered liberal mayor Pawel Adamowicz, whose public stabbing has raised questions about hate speech in politics in the country. Recently released, the man claimed he was wrongly imprisoned by the previous government – led by the centrist Civic Platform (PO) party, to which Adamowicz once belonged. For many Poles, the mayor’s murder cannot be solely blamed on the knifeman but also the prevalence of online hate speech and toxic divisions between the main political parties. “A well-organised, crazy hatred directed at a man who with the help of thousands of Gdansk residents was building this great, proud and free city,” he added. Numerous media outlets have compared Adamowicz’s murder to the 1922 assassination of Polish president Gabriel Narutowicz by a fanatical nationalist at a time of rampant hatred. Since Adamowicz’s death, Polish police have detained several individuals for uttering or writing threats against other politicians. Adamowicz’s Gdansk funeral will take place today at St Mary’s Church, one of the largest brick churches in the world, where his casket will be permanently located. Email “'It's hatred that killed Pawel': Poland bids farewell to murdered mayor”. Feedback on “'It's hatred that killed Pawel': Poland bids farewell to murdered mayor”.